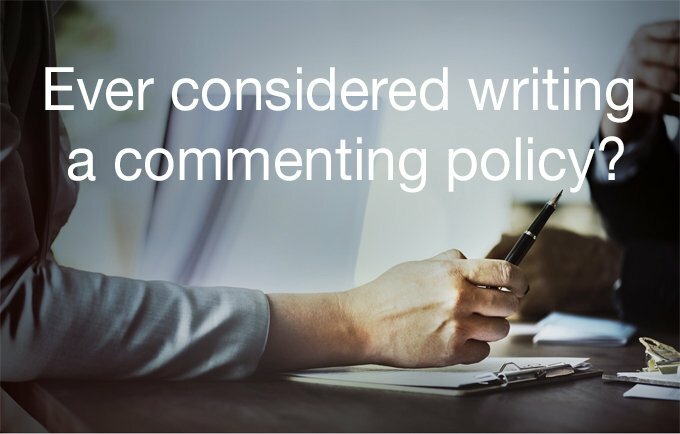 Ever considered writing a commenting policy? We all value good comments. However, it seems you can't guarantee getting worthy contributions every time. Not everyone is blessed with a vibrant commenting readership. But if you are, it might be a good idea to write a commenting policy to give your readers a guide to how to comment properly. It is a way of thanking your commenters by acknowledging their efforts. It also helps towards getting more comments accepted and published on your blog. The best way to encourage honest and on-topic comments is to give your readers a helping hand. They need to know what is acceptable and what is not. You may think your readers would already know this, but providing rules and regulations gives encouragement and offers a sense of community. It shows you really value their contribution towards extending the conversation you started in your posts. This provides a sense of security within your appreciation. Why have a commenting policy? It's a good idea to promote a sense of community with your readers. They will get a better experience of writing the kind of comments that have more chance of being accepted. Another thing to note is you shouldn't ban any comments that disagree with your post. Accepting only nice and agreeable comments makes pretty dull reading, whereas some alternative feedback provides more interest and credibility. Negative criticism could be useful and helpful, as it offers another point of view. It also shows you have a wide and varied readership who are prepared to have their say. Remember this is your blog, and therefore your reputation is on the line. If you value how you and your blog is perceived, it's worth laying down some rules so that your readers know how to behave appropriately. After all, anyone who comments is a welcome visitor, but they haven't the right to interpose or take over. Providing rules may put some people off. But that doesn't matter, since they probably weren't the right kind of commenters you wanted anyway. Anyone who appreciates you and your blog will value some guidelines on what you think is acceptable. There may be some people who say I cannot edit my comments. But since I edit my guest posts to preserve the quality of my blog, I extend the same sentiments to my comments. However, I may not edit all of them, just the really bad ones or the examples that really bug me! Do you have commenting policy? If you have any more suggestions to include within a commenting policy, please let us know in the commenting box below. Together we can create the best commenting policies that are suitable for all of us!